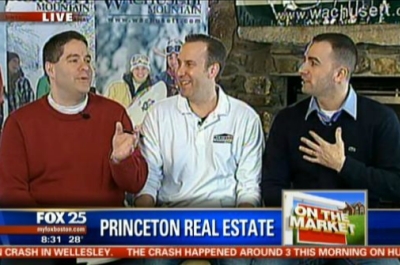 It’s time to go on the market as we sit here on the slopes with “Wa-Wachusett.” John and Anthony from Lamacchia Realty , either of you want to sing that jingle? We have to get to the bottom of whether it’s Wa Wachusett or Wa Wa Wa Wachusett? How many Wa’s are in there? I thought it was just the two so we’re going to clarify that later. Meanwhile John obviously you’re back and it’s great to see you because the complaint letters were coming in: too much Anthony! Too much Lamacchia! Where’s the other guy? I heard the ratings just tanked. We needed you back so that’s just good to see. I’m here so let’s right the ship here. This kid is addicted to skiing like to hear it. Coming here to ski at Wachusett, great place. Any time of year I can’t have him with broken legs. And somebody has to work. That’s true someone’s got to pay the bills. So let’s do that because we’re out here in Central Mass a lot of people in Boston watching right now don’t know this beautiful area. I know it well because I grew up out here. Princeton’s a great town, obviously Wachusett is a great ski area, that’s kind of the big thing out here. The average priced homes out here for a single family is $270,000. Small town, so population is 3,500. The thing I love about the real estate out here among other things the nature and all that, you get land with these houses—you get space. You want a dog, you come live out here because those dogs can run wild. All these houses that we’re talking about got at least an acre. My ping pong table I think is more in line with me, we’ll hold on the pottery for now. I’m just trying to give you a little creative outlet. So once again a great opportunity here, it’s listed for 350,000. This same home, like we talked about back with Top 3 Towns, Westwood, this same home in Westwood would go for $8-900,000. So you’re definitely getting a lot of bang for your buck. As the ads tell you, you’re not that far from Boston here. Just jump on Route 2. Boom you’re right there. It took about an hour to get here. So next one is 85 Main Street on for $450,000, it’s a 3,200 square foot house, built in 1870. The nice thing about this house is they did a lot of remodeling, but they kept a lot of the old world charm, for example, the hardwood floors. It’s pretty to cool to have a home that has the original hardwood floors , 4 bedrooms, 2 and a half baths, Shannon will love this, I hope she’s listening, 2 islands in the kitchen. The way she’s eating right now as she comes down the home stretch she needs the 2 islands. We had her at Bobby’s Burgers Palace the other day. Shannon I’m not getting into that. Am I right? Shannon’s backing me up on that fact. God bless her you gotta get the nutrients down the little Shannon there. She’s eating for two. That is true. By the way, the way you sell this house, the only thing I’d add is the brook off the back absolutely love it . That’s right big back deck looking at the brook. So it’s real nice. Your own little waterfall. Who has that anymore? But you can get that out here in Princeton. Tell me about number 3 now John, you we’ve had way too much Lamacchia. I’m still recovering over the Shannon comments. You get away with murder. She’s got like one week to go, you’re eating. She always says the girl loves her island, not islands. You guys started me on this it never happened when Anthony was solo John maybe you’re the one. Quickly tell me about number 3. Ok so last but not least 106 Houghton Rd. this one’s on for $520,000. Which is a little higher for Princeton, but you’re getting a tremendous amount of land. You get almost 4 acres. 3500 square feet, 4 bedrooms, 6 burner stove, in ground pool, you have a huge barn that’s heated. You had me at in ground pool. So everything you can imagine this home has. This is a perfect compound type mini estate. I see the Mulaires growing up in a house like that, little Shannons. John and Anthony great to see you guys and you got the family up on the slopes.